Combat Prescription Drug Prices With RxYouSave's Prescription Discount Card! Contact Us In The Partner With Us >> About Us Section! Looking for a way to combat ridiculously high prescription drug prices? You've come to the right place! 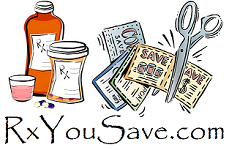 The RxYouSave Prescription Discount Card delivers significant discounts on both brand name and generic drugs at over 60,000 pharmacies nationwide. When you use RxYouSave, you can save up to 85% off the entire cost of your Prescription Medications. This goes a long way to reduce the cost of high prescription drug prices. If you are Uninsured, Underinsured, in the Medicare Doughnut Hole or have a high deductible health care Insurance Plan, then this free drug card is for you. The RxYouSave Prescription Discount Card has the highest savings of any other card out there on the market today. You may already have a prescription discount card, but consider this: Your current Prescription Discount Card may sell your personal, private information to drug and insurance companies for profit. Next thing you know, you are getting direct mailings and telemarketing calls at all hours of the day. Rest assured that with RxYouSave, your personal private information will NEVER be sold to anyone, for any reason. We dislike the thought of spam just as much as you do. RxYouSave is a Pharmacy Benefit Manager (PBM) that negotiates with the Pharmaceutical Companies in order to receive lower prescription drug prices for people who decide to use our Free Prescription Discount Card. RxYouSave is not, and will never be an actual Pharmacy where you get your prescriptions filled. In this section we list answers to commonly asked questions regarding the RxYouSave Prescription Discount Card. Any questions that you have that are not listed, please contact us and let us know, and we will add them. The Frequently Asked Questions is located in the About Us Section. In this section is a special Partnership specifically designed for Hospitals & Hospital Emergency Departments who wish to participate in distributing our cards to their patients. If you would like to distribute our free cards, there is a form to fill out in this section. Here is where you can sign up to get updates on the site as we add them. You will also get notified of articles that we write when we write them. Don't worry--we aren't going to inundate your inbox like some newsletters do! Your email will never be sold or rented to anyone for any reason, we promise! If you are searching for non profit fundraising ideas for your organization, look no further. We have a unique opportunity for you to consider that will bring your organization much needed funds year around. Visit this section to learn more about it! In this section you will find our Pharmacy Finder & Prescription Drug Prices Tool. Here you can look to see for yourself what you can expect to pay for your prescriptions when you use the RxYouSave Card. That way you can decide for yourself if the RxYouSave Prescription Discount Card is right for you. All prescription drug prices are estimates. In this section is a special announcement letter specifically for Physician Offices who wish to participate in distributing our cards to their patients. If you would like to distribute our cards, there is a form to fill out in this section. In this section, you can print a Free Drug Card for you to use. Each card can be used for unlimited medications. Are you currently a member of a Chain Pharmacy's (CVS, Walgreen's, Rite Aid, Target, etc.) prescription savings club? You will want to reconsider your membership with those companies once you read the facts we list here. Not only do we list the facts, we also provide the official URL Live Link documentation from their company websites so you can check it out for yourself! Here we list the competition's drug lookup price tool as well, because here at RxYouSave, we want you to save the most money on your prescriptions, even if it's not with us. How many companies do you know that have that philosophy? You will be astounded at what you find out, because we surely were! Is your school looking for new ways to make money? Introducing one of the most unique school fundraising ideas ever. This particular school fundraiser will bring in money all year around--even in the summer months! Visit this section to learn more about it! Are you a Telemedicine Company wishing to help increase your Patient Medication Compliance while also benefiting from a mutually Symbiotic Partnership that is a WIN-WIN-WIN for all involved? In This Section you will learn more about an Opportunity Unique to Telemedicine that you may not have thought of before!